Disney's Animal Kingdom at Walt Disney World showcases nature, animals, and adventure. Although much of the park and its attractions highlight an African theme, also expect to see animals from the past appearing in shows and fun rides. Attractions at Disney's Animal Kingdom incorporate a wide variety of technologies that have been refined by Disney—including animation and 3-D. Live shows are colorful and entertaining, and parades showcase character-based safari vehicles, drum sculptures, rickshaw taxis, animal puppets, Disney characters, and Party Animal stiltwalkers. While it's nearly impossible to see all the attractions at Disney's Animal Kingdom in one day, you'll want to make sure your plans include at least one or more of the following top 10 can't-miss attractions. The Camp Minnie-Mickey area of Disney's Animal Kingdom theme park holds a special surprise. 'Festival of the Lion King' is a 30-minute musical stage show based on the movie "The Lion King," and it's perfect for all ages. The colorful Broadway-like production is performed in an air-conditioned theater-in-the-round with guests seated in low stadium-type seats. Climb aboard the all-terrain safari vehicle and let Disney take you on an adventure as only Disney can. On the Kilimanjaro Safari, your guide will point out the wild African animals—zebras, rhinos, lions, and giraffes—and all you have to do is shoot ... a picture, that is. Prepare to be entertained by your "guide." Your adventure will be interrupted by "dangers," just like the real ones threatening the world's wild animal population. During your safari, you'll travel rutted dirt trails, cross shallow waterways, and plow through heavy vegetation to reach a spectacular view of a vast savannah. Before your adventure is over you will see termite mounds up to 20 feet high, dodge geysers spouting 20 feet into the air, and capture poachers. One of Disney's most exciting coaster experiences, Expedition Everest brings the legend of the Yeti to life. It's hard to miss the impressive landmark mountain located in the Asia section of Disney's Animal Kingdom but easier to pass on the ride if you're not a roller coaster enthusiast. The roller coaster features steep climbs, breathtaking plunges, and even backward slides that will leave you breathless. Riders on Expedition Everest must be at least 44 inches tall. Expedition Everest is an intense ride, and you should be in good health and free from high blood pressure; heart, back or neck problems; motion sickness; or other conditions that could be aggravated by this adventure. Do bugs have a tough life? If you ask the army of insects appearing inside the Tree of Life theater at Disney's Animal Kingdom, you'll get your answer. The inside buzz is that bugs get no respect. Special effects, 3-D animation, and audio-animatronics characters bring to life "It's Tough to be a Bug!" While awaiting entry to the theater, you'll wind your way through a mass of gnarled roots and collect your pair of bug glasses. Inside the theater, custom log seating and a vine-draped ceiling set the stage for a hilarious look at the oft-misunderstood life of bugs. Special effects shrink the audience to the size of bugs and turn the tables as they dodge the sweeping of a giant flyswatter and blinding fog of a giant can of "Bug Doom," among other adventures of a bug's life. On a hot day, this is a great place to get out of the sun and into some air conditioning. This attraction has no height or age restriction, but it might be frightening to small children. If your children love dinosaurs, they'll love TriceraTop Spin in DinoLand U.S.A. at Disney's Animal Kingdom. Although any age can ride TriceraTop Spin, the whimsical dinosaurs operate much the same way as Dumbo the Flying Elephant in Disney's Magic Kingdom, a longtime favorite and gentle ride for the youngest park guests. In Pandora's Valley of Mo'ara, you'll take a hike like you've never been on before. You'll see floating mountains and glowing (yes, you read that right) plants. Along the way, you'll also find shopping and restaurants that are unlike any others in the Animal Kingdom. It's a full-on adventure in another world. Avatar Flight of Passage is part of Pandora—The World of Avatar in the Animal Kingdom. Pandora is a lot like Earth, but not exactly like Earth. On this thrill-a-minute ride, you'll get a mountain banshee's-eye view of the moon of Pandora. Your exotic and exciting trip will take you over water, trees, and creatures on the back of this otherworldly winged creature in this rite of passage for a Na'vi hunter. Riders on the Avatar Flight of Passage have to be at least 44 inches tall. 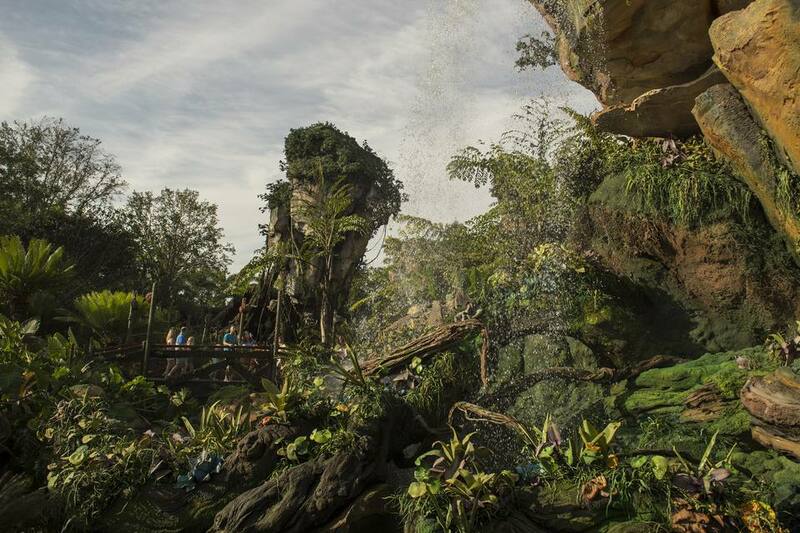 The Na'vi River Journey in the world of Pandora takes you deep into a bioluminescent rainforest in a woven boat. You'll feel enveloped by the rainforest, the darkness, and the out-of-this-world lighted features as you travel in search of the Na'vi Shaman of Songs. This is a slow and peaceful ride that even the smallest visitors can love. This walking trail takes you into a world of African wildlife, and it is not hard to guess that gorillas are the kings of this trail. But you'll also glimpse hippos under water and loads of exotic birds as you walk through forests and across savannas. The whole experience will leave you feeling pretty awestruck about Africa. Dinosaur is a thrill ride for the ages—or at least the Age of the Dinosaurs. You'll visit Earth on the very day that a huge meteor hit the planet and wiped out all the dinosaurs. Your mission will be to find and save an iguanadon before the meteor gets to Earth. You'll ride in a 12-seat Time Rover on this wild ride through a dark forest with meteors hitting Earth as you speed toward your goal. This is a dark and scary ride, and children must be at least 40 inches tall to go on the Time Rover.